Tridentis successfully performed on the MSC Engineering Design Services Contract for the Engineering Directorate, N7 at Military Sealift Command (MSC) N00033-13-D-8032 where we completed numerous task orders for developing mechanical, electrical, and structural, American Bureau of Shipping (ABS) approved drawings, work packages and cost estimates for all of the required modifications. Additionally, Tridentis was the prime contractor on the USS MOUNT WHITNEY Extended Service Life Program (ESLP). The ESLP is a multi-year, $100M effort consisting of five shipyard maintenance availabilities between FY2014 and FY2019. In support of these maintenance availabilities, Tridentis developed and managed over 100 shipyard installation specifications and drawings necessary to accomplish the ESLP scope of work. Additionally, engineering analyses, feasibility studies, cost estimates, surveys, engineering studies, shipchecks, and similar efforts were required to support the development of the ESLP work packages. The shipyard installation packages contained work specification, cost estimate, weight estimate, ABS-approved engineering removal and install drawings, supporting calculations, sortable Bill of Materials, and vendor catalog cut sheets. The following table is a list of some of the work we have performed on MSC vessels. T-AKR OERA Performed ship inspections, safety surveys, and machinery test inspection reports on the WATSON, GORDON, and SHUGHART Classes. This included 12 ships that were tested and surveyed. Reports were developed for all of these ships. 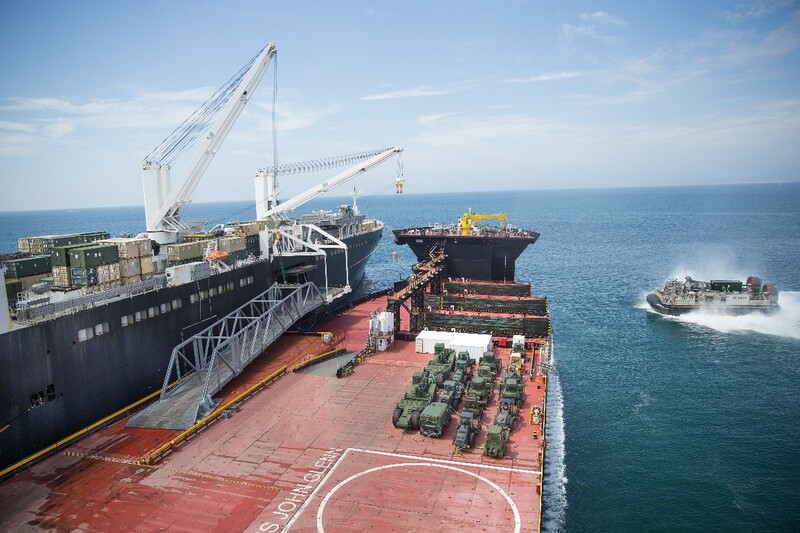 LCC-20 ESLP Performed six ship inspections and surveys of the USS MOUNT WHITNEY in various parts of the world. Developed detailed design packages and performed engineering analysis on the following systems: Rigid Hulled Inflatable Boats (RHIB) Boat Upgrades, Water Heating Analysis, Distiller Modifications, Steering Gear upgrades, Main Circulation Pump Business Case Analysis, Ballast Tank Level Indicator (TLI) Installation, Hotel Steam Valve replacement, Bulkhead Penetration Survey, Incinerator Installation, Seawater Strainer Modifications, Portable Water Supply Re-design, Water Heater Replacements, Forced Draft Blower Motor Modifications, Collection Holding & Transfer (CHT) Cross-Connect, Medical Ward Upgrades, Laundry Structural Fire Protection, testing and inspection of Redundant Power Supply, Rudder Stock, Ship Material Assessment and Readiness Testing (SMART) Inspection of the Generator Switchboards, Steering Gear Deck Grating, LP Control Air, Potable Water Storage, Sewage System/Marine Sanitation Device (MSD), Bilge System. T-AKE 1 T-AKE Damage Stability Provided technical support to study the effect that tank modifications on the T-AKE 1 class would have on damage stability. T-AGOS 19 Bulkhead Cracking Finite Element Analysis (FEA) Performed a detailed structural survey of the impacted area. Developed an FEA model, and provided a solution and ABS-approved work package to fix this safety issue. JHSV Piping Modifications Developed detailed drawings and work packages for the modification of three different piping systems on the JHSV. Mechanical, electrical, and structural drawings were developed. This task also included two ship inspection surveys. T-AKE 1 Seawater Piping Modifications Performed a detailed machinery survey of the existing seawater piping system and developed a report detailing the issues associated with the current system. We then developed mechanical, electrical, and structural, ABS-approved drawings and work packages for all of the required modifications. T-AOE T-AOE 6 Damage Stability Study Conducted a damage stability analysis for the USNS Supply to determine the impact of changing the damage criterion from one compartment to two compartments. The analysis and potential design changes to the oil cargo wing tank fill volume were considered. JHSV JHSV Support Provided an on-site Electrical Engineer to perform shipboard testing and inspection surveys, Root Cause Analysis and failure analysis, and Post-Shipyard Availability Planning of the JHSV located on-site in Norfolk, VA.
T-AGOS 20 Frame Cracking Performed a detailed structural survey in Sasebo, Japan, of the T-AGOS 20. Discovered numerous structural issues and developed a report on these issues. Using FEA tools, we developed a structural solution to the cracking issues, and then delivered a work package and drawings for the required modifications. T-AH AC and UV Sterilizer Installation Performed a ship inspection and then developed a market survey final report for upgrades to the AC Flow Control Valve and UV Sterilizer Selection. Once this market survey was reviewed by MSC, we developed a guidance-level work package for installation of these systems. T-AOE T-AOE Magazine Sprinkling System Performed a ship inspection of T-AOE Magazine Sprinkling System. Developed a report that detailed the costs associated with changing sprinkling systems. T-AKE T-AKE Magazine Sprinkling System Performed ship inspection of T-AKE Magazine Sprinkling System, then developed a report that detailed the costs associated with changing sprinkling systems. T-AO Aqueous Film-Forming Foam (AFFF) Skid Replacement Conducted two comprehensive Ship Inspection Surveys and developed a report with our findings from both inspections. Developed ABS/USCG-approved drawings for the replacement of the AFFF skids, along with their corresponding concentrate storage tanks. T-AH Recommendation Report Developed a report summarizing the work that was done and work left to do on both hulls. Areas of concentration were Hull, Mechanical, Electrical, Information Technology, and Medical Capabilities. T-AH Flight Deck Modifications Performed a ship inspection, and then developed drawings and work items for modifications to the flight deck structure and all affected ancillary systems to allow for two simultaneous MV-22 aircraft operations. T-AGM Seawater System Modifications Performed a ship inspection, and then developed drawings and work items for modifications to the seawater and freshwater systems to allow for freshwater cooling vice seawater cooling of major equipment. T-ARC Decontamination Station Installation Performed a ship inspection, and then developed drawings and work items for modifications to the vessel to install a new decontamination station.